The Cantonment Board Dalhousie, Is Recruiting Eligible & Interested People To The Various Posts. So Interested Indians Can Apply For This Job Through Online Mode, Within The Given Time Period By Recruiting Board. 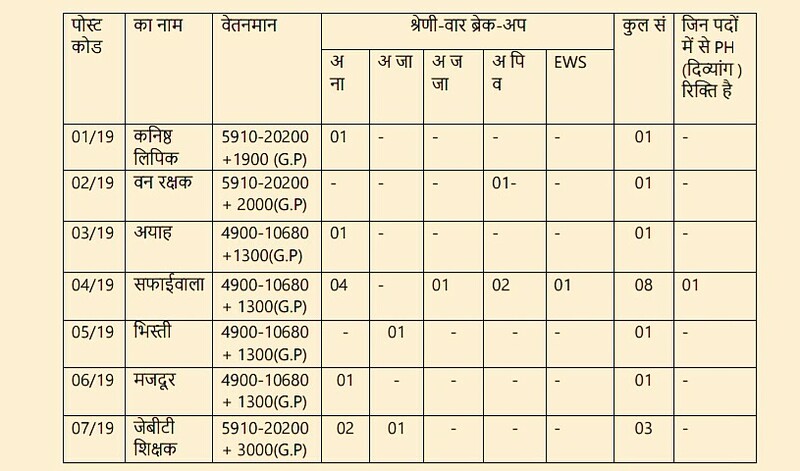 Total Number Of Vacancies →16 VacanciesVacancies, Kindly Go Through The Image Below For Vacancies Distribution, Scale Of Pay. (Credit- The Official Advertisement अजिम संख्या 01/2019). B. Eligible Criteria For Cantonment Board Dalhousie Recruitment Notification 2019. Age Limit →18 To 25 Years As On 11th Of May,2019. Educational Qualifications→Check Out The Official Advertisement. Mode Of Examination/Selection Process →Selection Is Based On Direct Recruitment Basis, Written Exam/Interview/Physical Efficiency Test. Online Application/Examination Fee →₹500 For Unreserved Candidates And No Fee For Other Reserved Candidates. Last Date For Online Application Form Submission →11th Of May, 2019. For More Info →The Official Website Cantonment Board Dalhousie. Now Apply For This Job Of Cantonment Board Recruitment 2019.